The start-up of a motor with a three-phase auto-transformer consists in reducing (via an appropriate connection and only for a few seconds in the starting phase) the supply voltage to the motor. Usually it is adopted for high-power motors because, as voltage is never lacking during start-up, it eliminates current spikes. The rotor can be either of the wound type or the cage type. It also enables a more gradual start-up as various intermediate taps can be used for a three-phase auto-transformer. Considering the dependence of the torque on the square of the voltage and the low value usually adopted for initial voltage, the motor must never start at full load. The figure on the right shows the diagram of a start-up by means of an auto-transformer with a single intermediate tap. Note that u, v and w are the start terminals of the motor phases. The protection devices are not indicated. First of all switch T1 is closed so that the auto-transformer is set up for star-type operation. T2 is then closed (keeping T1 closed) and the motor is powered via the auto-transformer at a voltage of 0.7Vn. Then, T1 is opened so that the motor is fed through the auto-transformer reactors which are in series with the line. Finally, the T3 is closed and the motor is powered at full voltage as the reactors are short-circuited. In the case we have considered of an auto-transformer with a single intermediate tap, the starting torque is reduced to 1/2 (as the voltage is 70% of the nominal value) and current consumption is also reduced to 1/2 of the nominal level (provided the motor is taken as a constant impedance load; in fact, 70% of its nominal voltage is applied to the motor and it will absorb 70% of the normal starting current, and this current is then reduced by a further 70% as the auto-transformer voltage ratio is 1 : 0.7). As they are intended for a time-limited service (10-20 sec. approx. 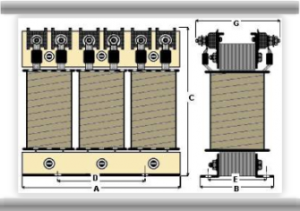 ), the auto-transformers for this type of use operate with high values of magnetic induction and with high current density values. For this reason they are much more compact and less expensive than auto-transformers for continuous service. 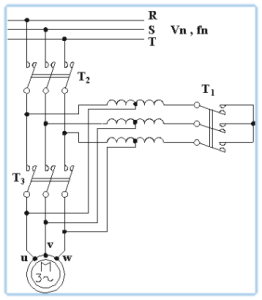 The table below indicates the dimensions (mm) of some auto-transformers that we have standardized with a line voltage of 400V and an output of 280V at 50-60 Hz. 2 consecutive starts and 3 starts/hr of 12 sec. A 30% drop in voltage at no load and 35-45% with respect to the nominal value at motor start-up – The torque of the motor at the start amounts to less than half the nominal value. Insulation materials of Class F (155°C) and of class H (180°C) and a Ta of 45° C.
Impregnation with tropicalizing paints and resins with oven-firing. Routine or type-based testing on each piece. All metal components are galvanized. Electrolytic copper conductors in class H or higher. Yn 0 vector group with a neutral wire that can be disconnected. Standards IEC EN 61558-2 BS 13 171. We are suppliers of each type of industry which requires the use of electrical and electronic equipment.